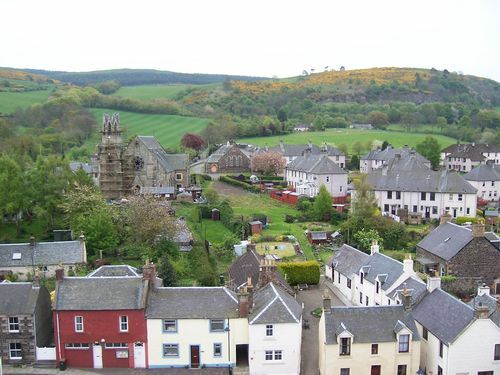 When I was seven, we went to live in Scotland, just for a year, because of my father’s job. It was a magical year in so many ways for me, with a lot of “firsts” — snow, deer, Scottish schooling, and much more. I will never forget my own “secret garden” moment — I wote about it on the word wench blog and you can read it here. We did a lot of travelling that year. We had a caravan and every second weekend Dad would hitch up the van on Friday after work, and we’d head off to some part of the British Isles. Australians are used to driving long distances, so it seemed quite normal to us, but the local people were quite stunned that we’d been to Land’s End, or John O’Groats (which are on the southern and northern end of Great Britain) or somewhere in between — just for the weekend. At the end of that year we were returning to Australia. Our school year starts at the end of January, so we left Scotland at the start of the Christmas break and headed for London, where my mother’s uncle and aunt were living — Uncle Neil and Aunty Ella — to join them for Christmas. I’m sure we had a wonderful Christmas — my grandmother was a superb cook and I’m sure Aunty Ella (her sister) was too, and they had a beautiful house, and would have had a lovely Christmas tree and decorations, but I have no recollection of any of it. Not one thing. For me, aged almost eight, everything was eclipsed by one present — a pair of roller skates. 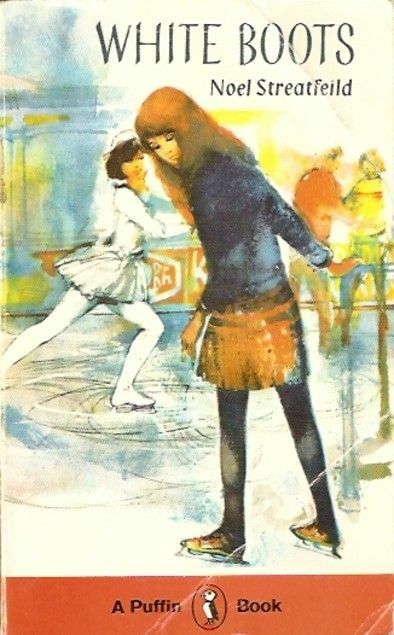 They weren’t “white boots” — the ice skates from a Noel Streatfield book I loved — they were the strap-onto-your-shoes type, and much more practical for a growing child and one, moreover, who would never see ice for skating in small town Australia, where we would be living. That Christmas day in London was damp and drizzly, but that wasn’t going to stop me. There were footpaths all around and I was itching to try out those rollerskates. So out I went, with my older sister to catch me when I fell, as I did often. But I lurched and swayed and stumbled along those wet footpaths until that magical moment when suddenly I “got it” and I was off and speeding along. Utter bliss. There are photos of that day, but they’re slides, and I have no idea where they are. Still, the memories are still very fresh. I suspect I had to be dragged inside when it started to get dark, and I do remember I was drenched and muddy and was thrust into a hot bath and scolded for letting myself get into such a state. But did I care? Not a bit. I could roller skate! My neighbors — two kids and their dad — knocked on my door the other day. Their uncle had sent them a microbat box for Christmas. It needed to be mounted on a tall tree, but they have no big trees. I, on the other hand, have a Very Big Gum tree (eucalyptus), so they asked if they could attach the microbat box to that. 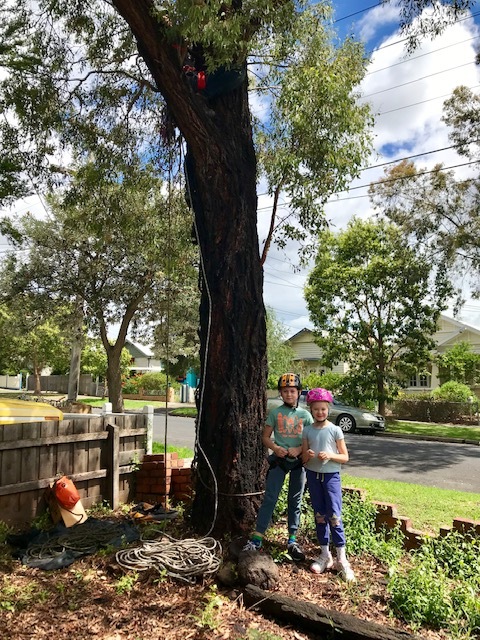 So yesterday morning the kids and dad arrived in their hard hats, dad with ropes and pulleys, and the installation process began. Unfortunately I was running out the door to meet up with a bunch of old schoolfriends. But I grabbed a few snaps. You can see how tall the tree is — and you can just catch a glimpse of the dad in the tree with the kids below. Before you get anxious about bat bites and rabies, these bats only bite insects, and I wasn’t planning to handle them. 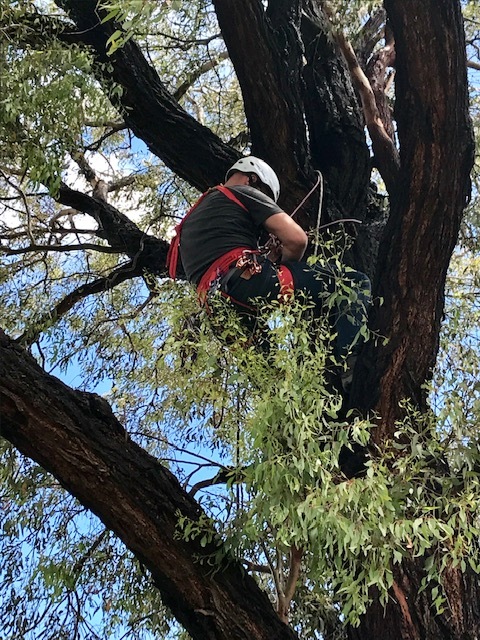 In any case, we don’t have rabies in Australia—that’s one of the reasons for our strict customs laws — though bats do carry a virus that is dangerous to humans, and shouldn’t be handled. 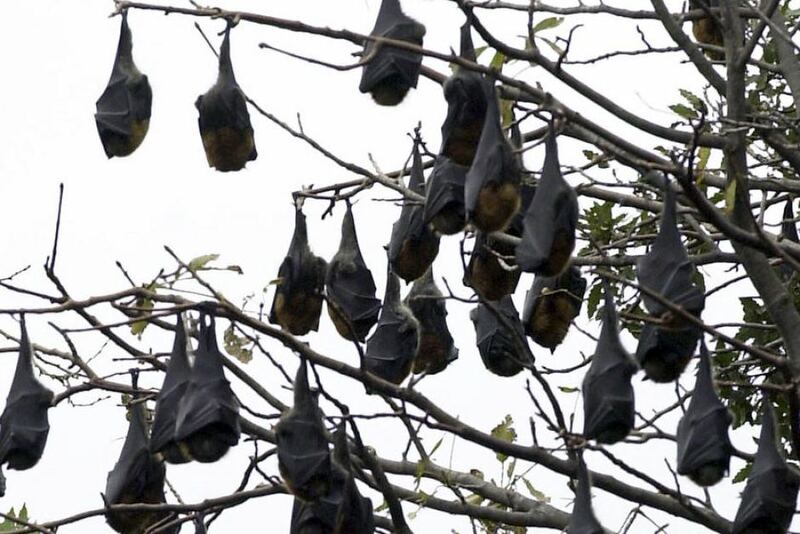 In the daytime the fruit bats (flying foxes) sleep in bat colonies in dense clumps of trees high up, looking a bit like lumpy old black umbrellas. But microbats are a whole new thing to me. As you can imagine, they’re tiny — here’s a photo of one. (Terri-Anne Kingsley – ABC Local) And while fruit bats live on fruit and flowers, microbats live on insects — they say just one microbat can eat up to 1200 mosquitoes in an hour. I love the sound of that. I hate mosquitoes. “These tiny creatures generally live in colonies of half a dozen. They are excellent insect controllers, consuming at least 50% of their body weight in insects every night.Their droppings are not known to be a source of disease and will dry quickly with little or no odour. 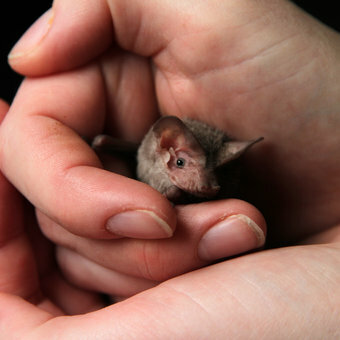 Microbats are clean and sociable animals that will not gnaw wood, wires or insulation.” So I’m looking forward to living with my tiny new neighbors — whenever they move in, that is. If you’re curious and want to learn more about microbats and microbat boxes, there’s a good site here and another one here. Would you install a microbat house near you? Or do you dislike bats? Do you love Christmas stories? I do, and I’ve been lucky enough to be asked to write a few as well. As you might know, I blog regularly (about every fortnight- that’s every two weeks for those not familiar with the term) with the Word Wenches. 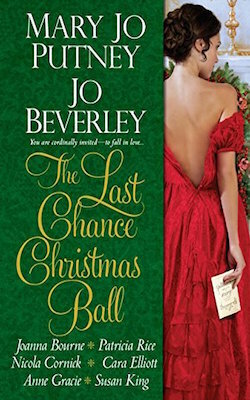 In the lead-up to Christmas, we’re doing Sunday posts containing an excerpt from our stories in the Last Chance Christmas Ball — one each Sunday. The anthology was such a fun—and tricky— thing to do. We wenches had written a Christmas anthology before based loosely around a theme, but for this one we decided all the stories would be linked, and based around an annual Christmas ball, held by Lady Holly. Some of us wrote interweaving stories, some of us made our stories linked, but separate, several of us had our people not actually make it to the ball. But we all had such fun doing it, we wanted to share it again. My story is called Mistletoe Kisses, and it’s about Allie Fenton, a young woman who, for various reasons, has never been able to attend a ball. Now orphaned and on the shelf (and only just out of her mourning period — see the black and white outfit above) Allie has to leave her home and become a teacher at a girl’s seminary in Bath. But first there’s her last Christmas at home and then, Lady Holly’s famous annual Christmas ball. . .
“I’m not being stiff-necked, truly I’m not. I’m just. . . surprised.” There was a lump in Allie’s throat. She was deeply touched by the old lady’s brusque kindness. And thoughtfulness. A ball dress. . .
. . . . SNIP (in which we skip a bit of the story). . . . The parcel, tied with string and wrapped in brown paper, lay on her bed. She untied the string and under the wrapping paper found an elegant box with a stylish gold emblem on the front. She swallowed. 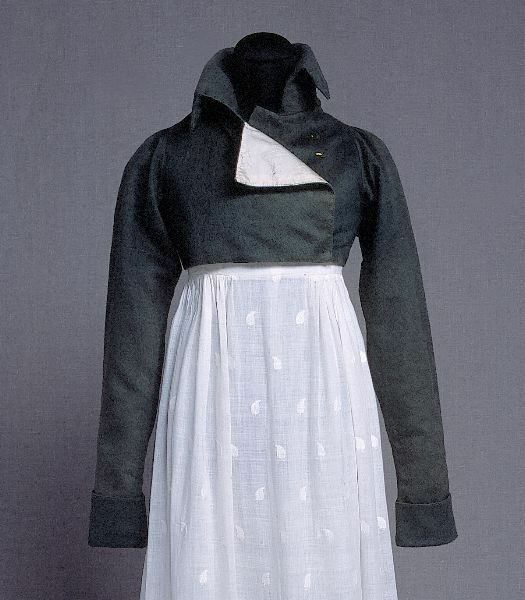 This was no dress from the village seamstress — it was from Lady Holly’s own London mantua maker. She eased off the lid, parted the layers of protective tissue paper and gasped. Almost holding her breath, she drew the dress from its nest of tissue. It was beautiful. The underdress was a light shimmering lilac shade that she just knew would go perfectly with both her recent mourning, and also her coloring. 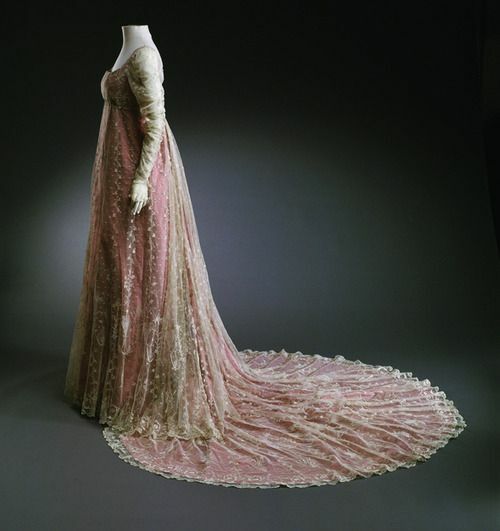 But the lovely silk underdress was quite cast in the shade by the delicate overdress in some kind of gauzy fabric through which the lilac silk shimmered. 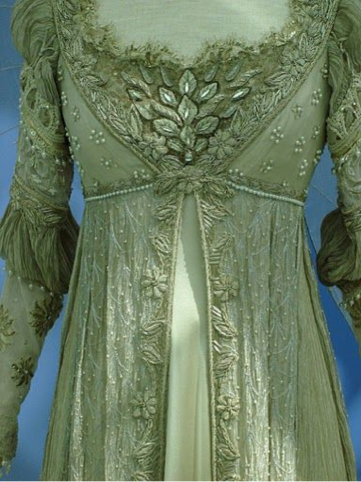 Embroidered here and there with tiny rosebuds in silver thread, it was finished with bands of delicately gathered silver lace around the hem and at the elbows of the puffed sleeves, and a line of silver embroidery around the neck. In the box, hidden beneath the dress, was underwear — not the kind of underwear that Allie had ever in her life worn — delicate, lacy, flimsy, exquisite underwear — a chemise, a petticoat, the daintiest, most feminine drawers, and even a corset. All were trimmed with lace, and everything but the corset was practically transparent. Almost scandalous. She remembered Lady Holly’s comment that she had the figure of a woman now, not a girl. Allie had never really given it much thought. But now . . . these were certainly underclothes for a woman, not a girl. Smiling to herself, she put the lovely, naughty underclothes back in the box. She’d probably die a spinster, but she would treasure these forever. She picked up the dress again, held it against her body and turned to gaze at her reflection in the looking glass. It was the most beautiful dress she’d ever owned. And it suited her perfectly. The lilac color complemented her pale complexion and her dark hair, and even seemed to make her very ordinary gray eyes look almost exotic. The silver thread gleamed and shimmered in the light. It was a dress made for dancing. . .
How many years since she’d danced? And never at a ball. Delight bubbled up in her. After what felt like years wearing mourning black and gray, this dress felt like a breath of spring. And yet even the highest sticklers could not look askance at her — lavender and lilac were approved colors for half mourning. But would it fit? She stripped off her old black gown and, holding her breath, she carefully slipped the ball gown over her head. And breathed. It was perfect. It was more than perfect. She gazed at her reflection, gave a sudden laugh and twirled around and around, as if she were a giddy, carefree girl again. She felt just like Cinderella. And she was going to the ball. I hope you enjoyed my little snippet from The Last Chance Christmas Ball. If you haven’t read the story or the anthology, you can buy it as a paperback or an e-book at all the usual places. Did you like the dresses in this post? The first is clearly a mourning outfit — no colors. The second is simply pretty — I do like a green dress, and I sometimes wonder if this is the “pomona green” mentioned in several of Georgette Heyer’s novels. And the third is the dress that inspired Allie’s dress in the story. I know hers isn’t pink and doesn’t have a train, or lace — but that’s how a writer’s imagination works — take something real and turn it into something else for a story. It’s the impression that counts. I’ll post another Christmas snippet in a couple of weeks.